Do you believe that children, their quality of education and their well-being sit at the heart of your school? Are you opposed to the government’s current regime of high-pressure testing as a way of measuring schools’ progress? Are you concerned about its effects on pupils and staff? 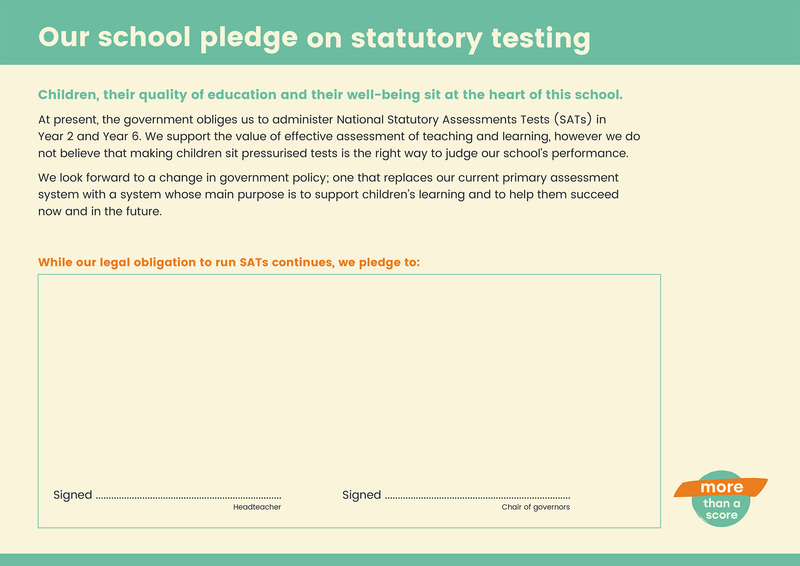 The More Than A Score Pledge is a demonstration of a school’s beliefs about assessment and its commitment to support children’s overall education ahead of SATs and other forms of testing. It’s then shared with parents and displayed in your school. We believe the Pledge can show how your school is putting children first. It will also build national momentum behind our campaign to overhaul the flawed assessment and accountability system. We will send you an A3 copy of the Pledge for your school, plus additional copies to share with fellow headteachers.